How to prevent liver diseases through healthy diet? The liver is the largest internal organ of the human body. It is the only one able to regenerate himself. It has more than 500 functions, the main ones being: fighting infections, neutralizing toxins, making proteins and hormones, controlling blood sugar and helping blood coagulation. With the “detox” fashion, many people are tempted to use these means to improve liver function. However, be aware that a healthy liver performs very well and without external help this detoxification. My Liver Exam offers you, through this article, an overview of the beneficial foods for your liver. Individuals with high cholesterol *, high blood pressure *, insulin resistance, abdominal obesity or diabetes increase their risk of developing liver disease. It is important to manage these conditions when we talk about liver health. Therefore, the composition of your diet can directly influence the development of certain liver disorders (non-alcoholic liver diseases). Handling macronutrients * or micronutrients * may affect inflammation levels, blood lipids (cholesterol levels), and insulin resistance. Here are the highlights. The replacement of carbohydrates with mono-unsaturated fatty acids (MUFAs) * increases catabolism * of lipoproteins * rich in triglycerides. In two experiences, patients following the Mediterranean diet, compared to those with a diet of the same caloric value but low in fat and high in carbohydrates, experienced a 29% to 38% reduction in liver fat and an improvement in sensitivity to insulin.2-3 The Mediterranean diet was rich in MUFA from olive oil and also contained polyunsaturated fatty acids (PUFAs) * omega-3 of vegetable and marine origin. Fish with pink flesh are the best sources. 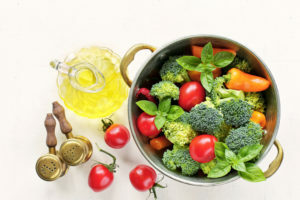 The macronutrient composition of the diet was 40% lipid energy (50% MUFA and 18% omega-3 polyunsaturated fatty acids), 40% carbohydrates and 20% proteins. These results were independent of weight loss. Finally, a diet rich in antioxidants appears to be desirable for improving liver function. These would have a role to play in the inflammatory processes associated with certain liver diseases. Foods rich in monounsaturated fatty acids: nuts (especially macadam / hazelnut / almonds / pecans), olive oil, canola oil, avocado. At the level of omega-3 fatty acids (especially EPA / DHA), the main sources are: mackerel, herring, sardines, anchovies, salmon, and trout. Here is a chart with the glycemic indexes of different foods containing carbohydrates. The recommendation is to favor those with a low glycemic index (GI). High intake of whole grain cereals (barley / quinoa / whole meal bread / whole grain rice / buckwheat / millet), vegetables, legumes (chickpeas, lentils, beans), fruits, nuts and olive oil. Regular consumption (2-3 times a week) of fish and seafood. Moderate intake of dairy products, poultry and eggs (once a day a few times a week). Moderate alcohol consumption, mainly red wine with meals. Low consumption of red meats, cold meats, sweets (a few times a month only). Abundant use of spices and herbs. Here are the foods richest in dietary fiber: bran cereals, beans, red berries, peas, nuts and seeds. Vitamin C: guava, peppers, kiwis, strawberries, citrus, papaya, Brussels sprouts, broccoli, leafy vegetables, tomatoes and potatoes. Vitamin E: almonds, sunflower seeds, vegetable oils, leafy vegetables, peanuts and peanut butter, sweet potato and avocado. Selenium: Brazil nuts, fish, crustaceans, meat, poultry, grain products, wheat germ, wheat bran, beans, oats, bran and eggs. Carotenoids: kale, tomatoes, spinach, sweet potato, carrot, leafy vegetables, pumpkin, squash, guava, watermelon, grapefruit. Flavonoids: berries, cherries, red grapes, onions, apples, cocoa, green tea. Maintaining a weight within the normal limits of body mass index (BMI between 18.5 and 25) is recommended. However, rapid or too rapid weight loss is discouraged. A rate of 0.5 to 1 kg per week is considered healthy. * Hypercholesterolemia: A disorder of fatty acid metabolism characterized by a high total blood cholesterol level. * Macronutrients / micronutrients: Macronutrients provide calories or energy. These are lipids, proteins and carbohydrates. Micronutrients include vitamins and minerals. * Mono Unsaturated Fatty Acids (MUFA): A fatty acid molecule that contains a single double bond between carbon atoms. They are liquid at room temperature. They are considered good quality fats. They include oleic acid, which is very present in olive oil and canola, for example. Nuts and grains as well as avocado also contain monounsaturated fatty acids. * Catabolism: all the reactions of molecular degradations of the organism considered. * Lipoproteins: molecule resulting from the combination of proteins with lipids. It is the form of transport of glycerides in the human body. There are three types of lipoproteins including LDL and HDL that carry cholesterol. * Polyunsaturated Fatty Acids (PUFA): A fatty acid molecule that contains more than two double bonds between carbon atoms. They are liquid at room temperature. They are considered good quality fats. They include the most known fatty acids: omega-3 and omega-6. * Eicosapentaenoic acid (EPA) and docosahexaenoic acid (DHA): omega-3 fatty acids that have beneficial effects demonstrated by cardiovascular science in particular. They can be synthesized from alpha-linolenic acid or come from food through the consumption of fatty fish (sardines, mackerel, salmon, and herring). ut felis massa ut velit, eleifend adipiscing Phasellus elit.